Mini Stone Shaped Diamond Silver Necklace : LOVE2HAVE in the UK! This particular handmade silver and diamond necklace literally boasts rock-solid designer styling as it comes in the form of a stone shaped pendant. 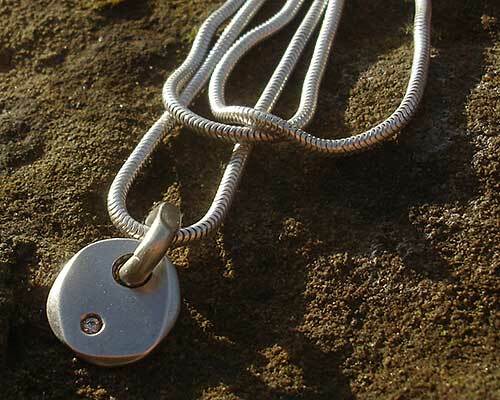 The pendant is in solid silver and features random shaping and faceted edging just like natural stone. Set towards one side at the bottom edge is a 1.5mm shiny white diamond. Each pendant is uniquely handmade so the facets and shape of each piece will vary slightly from the image. It also somewhat resembles a stone used for Cairns. Avid hill walkers and the outdoor pursuit community will recognise what we mean by this. The pendant is securely strung onto a silver snake chain by a robust silver link that again is designed in a filed shaping for those that appreciate style. This piece is also suitable for a personalised engraving so you really can carve your message forever in stone. The pendant size is approximately 12mm x 10mm in size, smaller and less expensive than the larger option we also feature in this section.